After Eden starts off like any other young-adult novel that attempts to mix in a little bit of science-fiction into its contents. We of course get the typical new guy arriving at school to hordes of girls falling head over heels for him because he’s hot. No other reason, but because he’s good looking. And of course, this new guy Ryan seems to take an interest in Eden. I’m just going to say now that while this novel was both predictable and mind-numbingly cliched, it was still a rather cute read. I did enjoy it a lot more than I’m probably describing it right now because I read it when I was right in the mood for something that was essentially a fluff piece. But on reflection of the entire novel, its flaws began to unravel. After Eden relied heavily on its romance between Eden and Ryan to propel the story forward. I found the relationship between the two characters rather cute, and it was not overwhelmingly nauseating to read because Douglas managed to build the romance slowly throughout the book. But in saying that, the ending was a big no-no in my books because it felt like the author needed to appease the readers. I’m a firm believer that stories do not always need a happy ending, and ones that essentially have one in order to keep the readers happy is a cop out mechanism by the author. I don’t actually mind cliffhangers either, and while it’s just my opinion, I think I would have been more excited for the next book in the series if this ending hadn’t happened. Another thing I found quite rushed and a little flawed was the relationship between Connor and Eden, and how it affects the story. As a time-travelling novel, it’s easy to figure out that some things had to be changed on Eden’s timeline – and for this story, it was the relationship between Connor and Eden. As most YA novels go, we have the bestfriend who’s in love with Eden, and his actions show it until he suddenly just changed his mind and focussed on someone else. That change was extremely sudden, and I think I understand why Douglas wrote it like that, but it was just so abrupt that it didn’t feel realistic. Another thing that didn’t feel realistic was how well Eden seemed to have taken to the idea of time travel. I really liked the way Douglas explained how it worked as it wasn’t too convoluted and hard to follow. Her version of time travel made complete sense to me, so kudos to the author for that! But Eden’s acceptance of it just didn’t feel right, and for an extremely logical character, I had wondered why she didn’t question the whole process more. And that of course comes back to the relationship between her and Ryan. Obviously the romance plays a huge part in her acceptance, which I didn’t think was a good enough reason. But Eden does remain a very strong and logical character, which I admired. She didn’t cling onto Ryan or complain when she knew he had to return to his own time after he completed his mission, and I really respected her for that. I liked Eden overall, and if it weren’t for my nitpicking, I would have enjoyed this novel a lot more. But that’s not to say I hated it either. I found the story interesting and finished it extremely quickly. It had a good paced plot and characters that were enjoyable to read about. 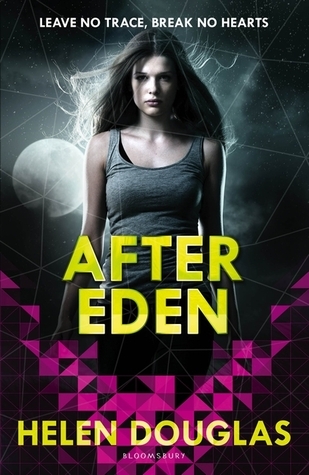 I will definitely be picking up the next book in the series just to see how the author continues Eden’s story. If you like young-adult novels that touches on the science-fiction genre but not too heavily, this could be the novel for you!